Morag, Nadav. Comparative Homeland Security: Global Lessons. 2nd edition. Wiley Press (October 2018). Students and practitioners of Homeland Security have generally not looked beyond U.S. borders in terms of searching for solutions to existing H.S. policy problems. 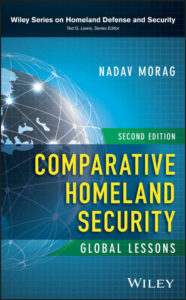 Comparative Homeland Security: Global Lessons examines overseas homeland security practices, allowing readers to integrate counter-terrorism, emergency response and other H.S. practices from around the world into our own policies. The book covers strategies for combatting terrorism, countering radicalization, emergency response, border and transportation security, critical infrastructure protection, public health and military support for civil authorities from a number of the world’s democracies. Organized topically, the book allows scientists, policymakers, law enforcement professionals, government workers and students of H.S. to easily compare and integrate the concepts presented into practice. Dr. Nadav Morag teaches for the Center for Homeland Defense and Security.